Black Sabbath have a UK #1 on their hands. The Belfast Telegraph reports UK retailer HMV has compiled a list of its best-selling classic rock shirts, with Sabbath coming in at number one, while Led Zeppelin take the second and third spots. "More often than not, rock T-shirts used to be something you'd wear to gigs to see your favourite bands, but over time demand has broadened and they've since become a bit of a fashion-statement in their own right,” said HMV’s Gennaro Castaldo. “Some performers can quickly come and go with the trends, but one genre that has an enduring appeal and seems to remain eternally popular with fans is classic rock and metal." "This year over half the top 30 best-selling T-shirts at HMV were made up of vintage artists and, even though many of them have not been active with new material, they continue to sell in large quantities as many of these acts are revered, and with that comes a level of cool-ness and style that money or promotion can't always buy,” he added. 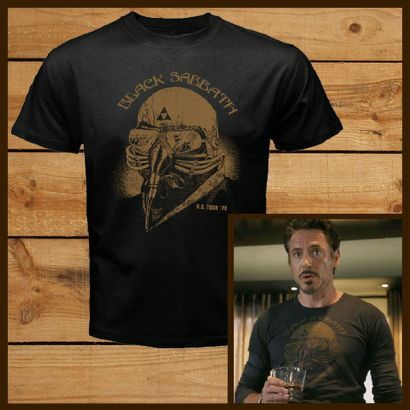 Sabbath are currently working with producer Rick Rubin on a new album, which is due in April; the band kick off their 2013 tour in Auckland, New Zealand on 4/20.